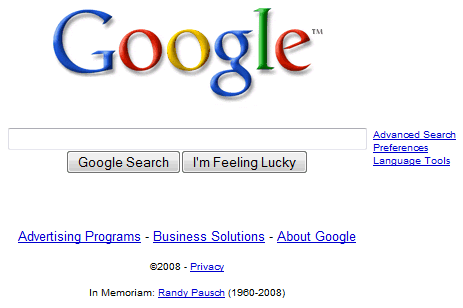 You may have noticed that Google's homepage has a small message at the bottom: In Memoriam Randy Pausch (1960-2008). "Pausch, the married father of three, was an energetic and fun-loving computer science professor at Carnegie Mellon University in Pittsburgh when, in 2006, he was diagnosed with pancreatic cancer. A year later, despite surgery and chemotherapy, physicians discovered the cancer had spread to his liver and spleen. He had been told he had perhaps six months to live," remembers Chicage Tribune. "Get a feedback loop and listen to it... Show gratitude... Don't complain. Just work harder... Be good at something, it makes you valuable... Find the best in everybody... And be prepared. Luck is truly where preparation meets opportunity." That's how it ends. The simple HTML link to hosted video speaks volumes about what is and should be important to Google employees and those they serve. Kudos to Google admin and the Google Homepage team for a classy tribute to a man and message that deserve to be immortalized. I agree with Brian, nicely done by Google. Mark Cuban blasts YouTube all the time, I wonder what he thinks about it now. It is not all money. This man was so inspiring to all of us. Here he is counting his blessings and living for the moment, rather than letting it drag him down. One of my blessings is getting to listen to him. I know he will be well missed. the publishing backstory about the book, the REAL story, not the media hype. more words, I'd add, 'All the time.' "
As news touched readers around the world in late July 2008, that Dr Randy Pausch had died of pancreatic cancer, the book that he dictated to Wall Street Journal columnist Jeffrey Zaslow -- THE LAST LECTURE -- was in the headlines again, too. The book is a bestseller, printed now in over 30 languages worldwide, and its life-affiriming message has touched millions of people. There were a few critics of the book, who became known as naysayers, but for the most part, the book -- agented by David Black, of the David Black Agency in New York, who was also the same agent for Jeffrey Zaslow even before THE LAST LECTURE became a book deal snagged by Hypersion Books, the same publisher who issued TUESDAYS WITH MORRIE, an earlier bestseller about life lessons which was also translated into over 30 languages worldwide (and written by Detroit News columnist Mitch Albom, who also uses David Black as his agent) -- the book became a widely-celebrated bestseller for all the usual reasons: it was well written, it hightlighted life lessons from a very insightful and popular professor dying of cancer at the age of 46, Randy Rausch, and its message was upbeat and universal. This backstory is a postive backstory, and it hoped that nobody will take this backstory in a negative way. But the way the book came to be, and the way the book was hyped by the media when it first came out, and even now, well ... there's an interesting publishing backstory from the publishing industry. This has never been reported before in any blog or newspaper in the USA. Most readers of the book could care less who the book came to be, and most of the reading public could also care less about this backstory. Maybe just a few people in the publishing industry will take notice of this and respond. But again, in memory of Dr Randy Pausch, a very good man, with a very important message, who often told people "tell the truth, the real truth", this blog post is meant merely as an interesting book world story. So how did THE LAST LECTURE become a book by Hyperion, the same publisher who issued TUESDAYS WITH MORRIE, and agented by David Black, the same high-powered agent who agented TUESDAY WITH MORRIE by his client Mitch Albom? Well, a week before the last lecture at Carnegie Mellon University, where Dr Pausch taught, and where he got his PHD, a fellow alum of Carnegie Mellon named Jeffrey Zaslow, who was and is a columnist for the Wall Street Journal and lives in Michigan (and who also had a contract with David Black the book agent for an earlier book that he had to put aside in order to do a rush job on THE LAST LECTURE)....Jeffrey got a phone call a week before the last lecture, which was set for September 18, 2007 at Carnegie Mellon University, from Clare Ansberry, the bureau chief of the Wall Street Journal in Pittsburgh, who herself had been notified about the last lecture a week before it happend by some public relations people at the university, and Clare suggested to Jeffrey that he come to Pittsburgh to attend the last lecture sesssion and write a column about it for the Wall Street Journal. Jeff even called Dr Pausch the day before he went to the last lecture, and they chatted on the phone, a day before the lecture. Jeff went. Two days later, his column appeared in the WSJ on September 20, appearing nationwide in the newspaper, and setting up a nice PR "word of mouth" and "word of bloggers" campaign nationwide, too. That means Jeff attended the lecture on Tuesday, wrote the article on Wednesday and handed it in to his editors, who scheduled it for publication the very next day. Did David Black the literary agent know about this pre-deal PR work that was going on? Had Jeffrey talked or emailed to his agent, David Black, about the impending trip and how it might make a great newspaper column and even a great "book" in the future? We don't know. Maybe. Maybe David Black didn't know anything about this. But in the book world, everyone knows everything, and if Jeff had the same agent already as Mitch Albom had, and David Black had agented TUESDAY WITH MORRIE, and Hyperion had published TUESDAYS to great success, it might be possible that David Black and Jeffrey Zaslow knew something might work out well for this lecture story. It's very possible they discussed this beforehand. Fast forward. Jeff wrote the column. It was well-received by the reading public and by bloggers nationwide. The PR people at Caregie Mellon put out a video of the last lecture the same day that Jeff's article appeared. The media world lit up, with emails from NYC to LA to Hollywood to Oprah lighting up the mediascape. Dr Pausch was booked for Oprah and other shows. All in a matter of days! Two months later, the book deal was announced. By Hyperion, publisher of TUESDAYS WITH MORRIE. With David Black as the agent of record. With Jeffrey Zaslow, friend and colleague of Mitch Albom, as the ghostwriter. The book deal for THE LAST LECTURE very likely fell into place the day the WSJ column by Zaslow appeared in print, with the agent and the author and the publisher knowing full well what they had. A very powerful book with a very powerful message, published by an expert in these kinds of books, agented by an agent who was a pro with these kinds of books, and ghostwritten by a popular WSJ newspaper columnist from Michigan, who once ghostwrote the Anne Landers advice column, winning the job over 10,000 other hopefuls. So this is a great backstory. When Zaslow wrote about the book his public articles, he never mentioned, before the book was published, that he got a call from the university sponsoring the lecture a week before the date, or that he spoke with the professor before he attended the lecture. He knew this, and his friends and agent knew this, but he didn't give a full disclosure in his September 20 column. He made it sound as if he just happened to go to this lecture 500 miles away. He also didn't mention that he was an alum of Carnegie Mellon and that Dr Pausch was also an alum of CM University. Mere details. Not important for a newspaper column. The public did not have to know all the details. Not then. Not now. It's just publishing industry shop talk. So a few questions remain. Why didn't Clare the bureau editor send a Pittsburg reporter to the last lecture, instead of asking CM alum Jeff to come all the way from Michigan to cover the story? Did Clare know that Jeff was an alum of CM? Did she know Jeff very well, or did she just have a passing acquiantance with him as a national columnist for her newspaper? Had they ever worked together before this? Did she know that Jeff also employed David Black as his book agent, the same agent that Mitch Albom used for TUESDAYS WITH MORRIE? Or did Clare not know any of this. Possibly. I guess the most important thing here is why didn't the first newspaper column by Jeff about this tell readers that he was an alum of CM, too, and that he also had the same agent as Mitch Albom, the famous TUESDAY WITH MORRIE agent David Black? And that Jeff was already at the time working on a different life story book with David Black, which he has postponed to ghostwrite THE LAST LECTURE book? I mean, why was none of this information made public before, or at least acknowledge, or even offered? I had to dig and dig and dig to connect all the dots and here they are: connected. Again, to repeat: it's a great book, by an important man with an important message for these times. This blog post is not in any way meant to be negative or taken negatively. It's a mere PR backstory that some people might want to know. You're hearing hoofbeats and thinking zebras when they're really just horses. Mitch Albom and I are friends, and Jeff Zaslow and I have become friendly, for instance, but Mitch and Jeff barely know one another. Everything is pretty well summed up in those paragraphs in Zaslow's May column for WSJ, and thanks by the way for sending the clip. Jeff wrote the story because it's a perfect fit for the column he writes, and because only a handful of people at the Journal would have been capable of it. Most of them are purely business writers. Darned good business writers, but business writers. Randy wasn't even sure he wanted to write the book, and he considered others as the co-author before deciding to work with Jeff." "Dear blogger: You're hearing hoofbeats and thinking zebras when they're really just horses." His speech was one of the best head fakes I ever heard! what is a head fake? head fake means a basketball player use head-moving cheating the player defend him;in the lecture means this moves is not the true instead of the meaning behind the fake move. Can you redirect transcript? This link doesnt work anymore.